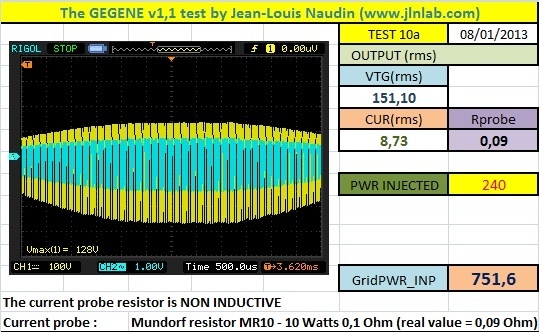 January 8, 2013 - TEST #9 : Here is a test of the GEGENE v1.1 in closed loop as showed by "Romerou UK" in the TEST#4. The excess of power is re-injected at the input via a Grid Tie Inverter (GTI). 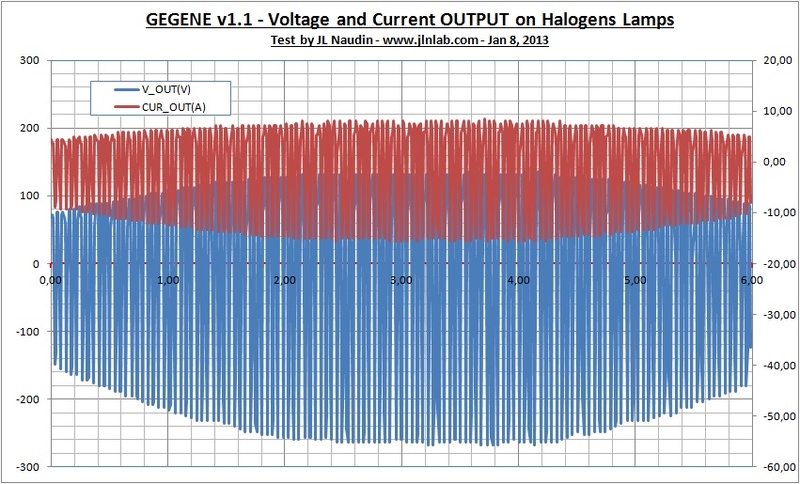 In this phase 2, the GTI and the GEGENE need to be connected to the power grid because the 50 Hz (60 Hz for the US countries) is required for its working. 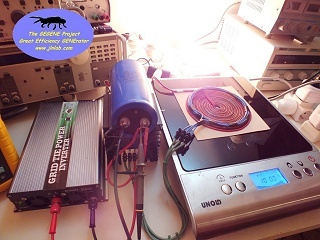 The setup used in this test is not sufficient to get a full autonomous and Off The Grid system (the GTI that I have used is limited to 500 W and the feed-back coil is under sized). A full Off The Grid and closed loop system will have to use a pure sinus inverter able to give 2500 W of power (battery powered) with a feed-back coil more powerfull. It will have to be electronicaly regulated and stabilized to prevent some eventual power divergence. 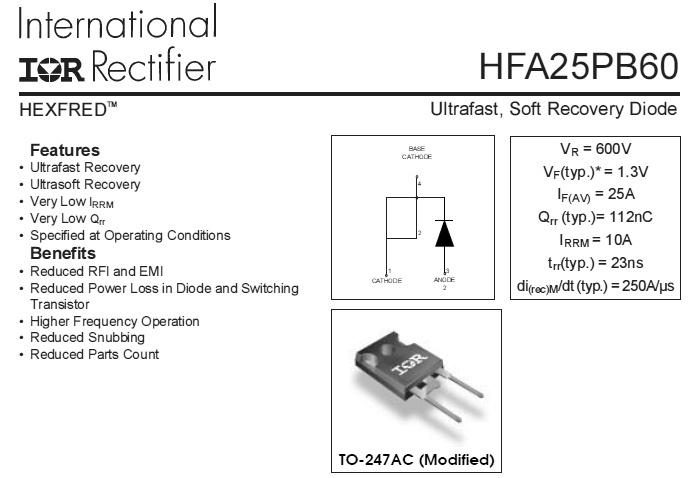 The dual feedback coil (2x3 turns of 1.5 mm2 with outer diameter of 160 mm) is connected to two ultra fast recovery diodes HFA25PB60 which provide a full wave rectification at 25 KHz. 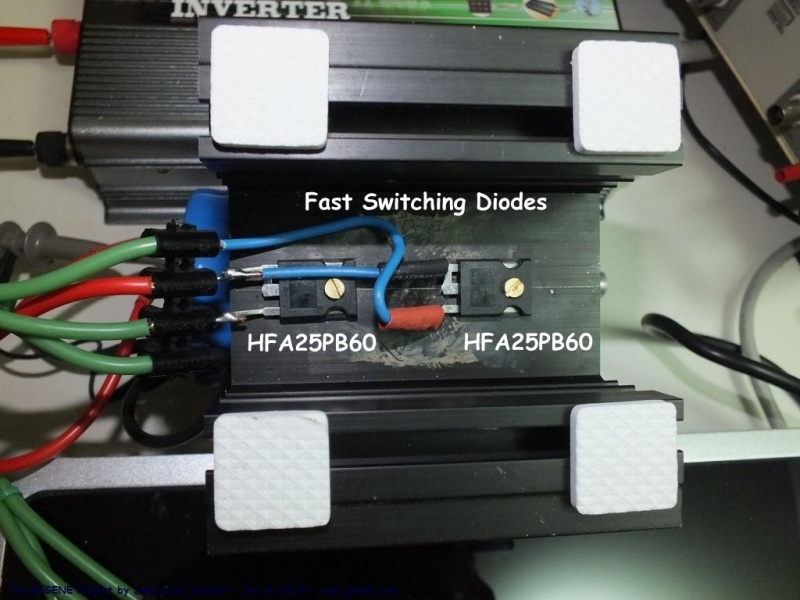 A 100 000 µF/63 V condensator is used to get a smooth DC signal for the input of the GTI (Grid Tie Inverter). Below the 2 ultra fast recovery diodes used for the full wave rectification process. 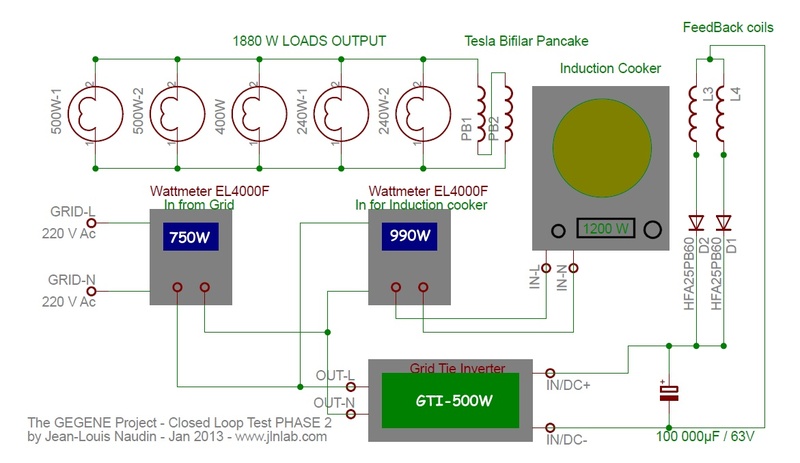 When the power is injected in the power grid through the Grid Tie Injecter (GTI) connected to the input of the induction cooker, a green chaser light of LEDS will run on the front of the GTI, the speed of this chaser light is proportional to the power injected. The DC voltage at the input of the GTI is monitored with a digital scope Fluke123. It is possible to adjust manually the amount of power re-injected, simply by moving the feed-back coil on the induction cooker. 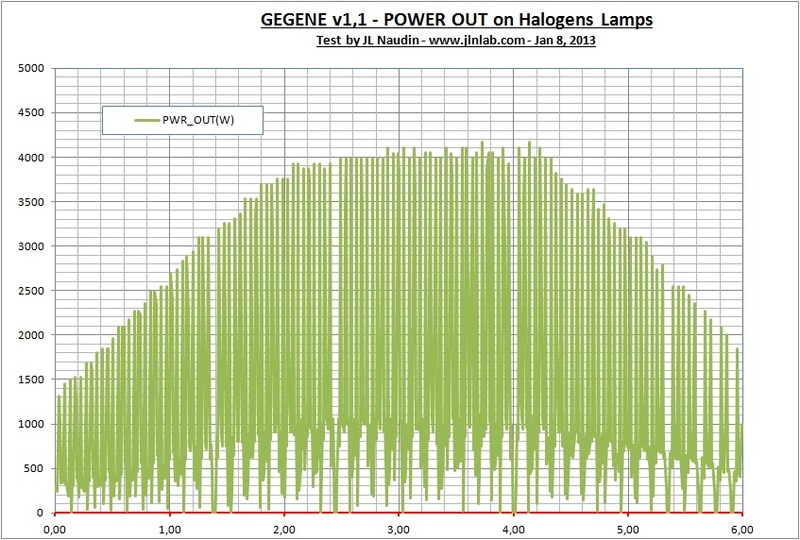 So, we are able to adjust the power ratio between the output power on the halogen lamps and the re-injected power. 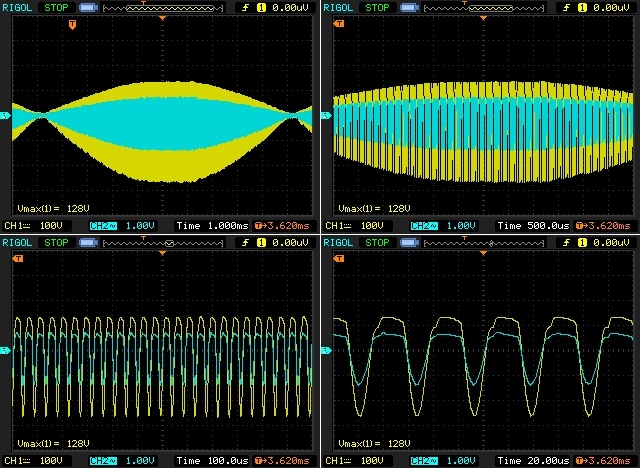 The power I/O measurements above have been done with a common digital oscilloscope. The two scope probes are set to X10 and are connected to the flat bifilar coil output. The probe Ch1 is used to measure the voltage accross the flat bifilar coil output and the probe Ch2 is used to measure the current i.e. the voltage accross a 0.1 Ohm non inductive resistor Mundorf MR10 10W. Then the datas are sent to a datasheet to compute true RMS values and the efficiency. 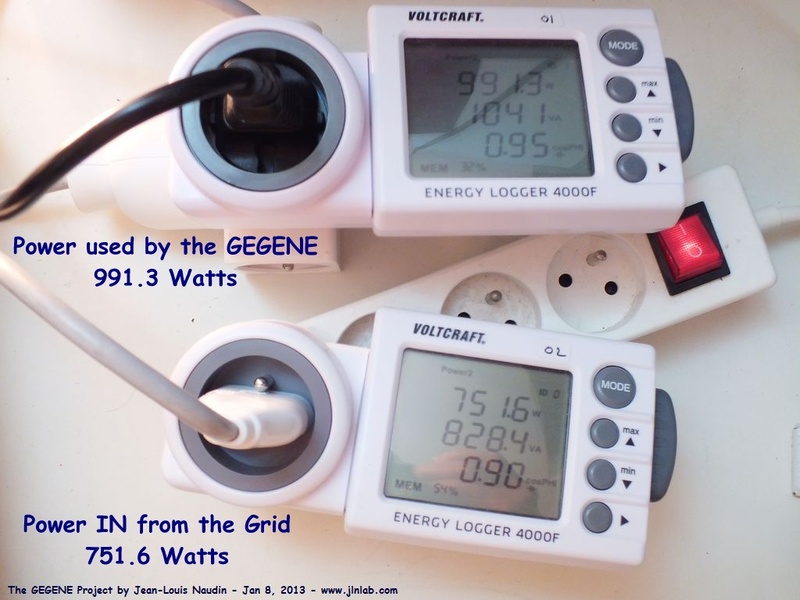 The measurements of the power P1 coming from the power grid and the electrical power P2 required for the induction cooker is done with two Wattmètres Energy Logger 4000F. The power re-injected by the GTI can be easily calculated by substracting the powers : P2 minus P1. CASE 1 : If 1.0 KJ is produced by the grid (measured with the energy-meter on the grid plug), firstly if 1.0 KJ is produced by the generator and secondly if 1.0 KJ is used by the load at the output, there is 1.0 - 1.0 = 0.0 KJ available for re-injection at the input... 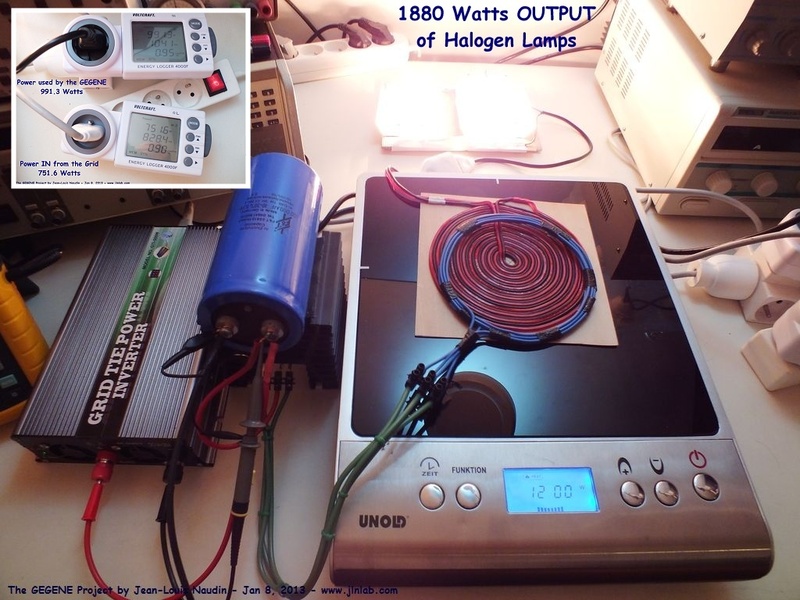 So, we measure 1.0 KJ on the energy-meter on the grid plug and 1.0 KJ on the energy-meter at the input of the induction cooker after the GTI. 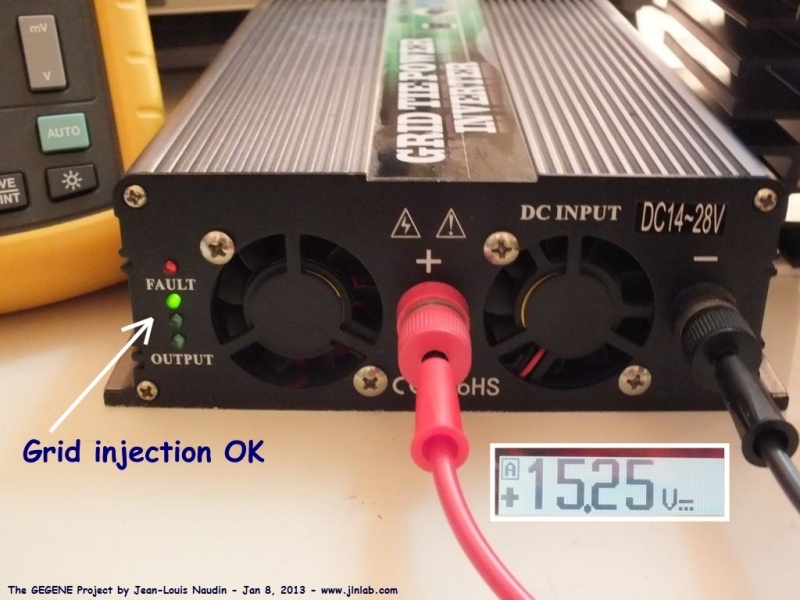 CASE 2 : If 1.0 KJ is produced by the grid (measured with the energy-meter on the grid plug), firstly if 1.5 KJ is produced by the generator and secondly if 1.0 KJ is used by the load at the output, there is 1.5 - 1.0 = 0.5 KJ available for re-injection at the input... So, we measure 1.0 KJ on the energy-meter on the grid plug and 1.5 KJ on the energy-meter at the input of the induction cooker after the GTI. CASE 3 : If 1.0 KJ is produced by the grid (measured with the energy-meter on the grid plug), firstly if 2.0 KJ is produced by the generator and secondly if 1.0 KJ is used by the load at the output, there is 2.0 - 1.0 = 1.0 KJ available for re-injection at the input... So, we measure 1.0 KJ on the energy-meter on the grid plug and 2.0 KJ on the energy-meter at the input of the induction cooker after the GTI. CAS 4 : If 1.0 KJ is produced by the grid (measured with the energy-meter on the grid plug), firstly if 2.5 KJ is produced by the generator and secondly if 1.0 KJ is used by the load at the output, there is 2.5 - 1.0 = 1.0 KJ available for re-injection at the input... So, we measure 1.0 KJ on the energy-meter on the grid plug and 2.5 KJ on the energy-meter at the input of the induction cooker after the GTI. the closed loop is not possible, the system is conservative, it produces as much as it consumes. (Phase 2) a closed loop Off the Grid is not yet possible, because the system need to be assisted by the power grid, the system produces more than it consumes but NOT ENOUGH to be Off the Grid. This is the beginning of the validation of a closed loop system. (Phase 3) a closed loop is possible here, the system can be disconnected from the grid (if the GTI is replaced by a pure sinus grid inverter). The system is balanced and produces as much as it consumes while it gives power for all the output loads. (Phase 4) a closed loop is possible here, the system can be disconnected from the grid (if the GTI is replaced by a pure sinus grid inverter). The system produces MORE than it consumes while it gives power for all the output loads and in addition it is able to charge a batterie.